When burned, trees generate more CO2 emissions per unit of energy generated than fossil fuels. An oft overlooked fact is that burning wood emits more CO2 than fossil fuels per megawatt-hour (MWh) of electricity generated or per unit of heat generated. For example, per data from Laganière et al. (2017), smokestack CO2 emissions from combusting wood for heat can be 2.5 times higher than those of natural gas and 30 percent higher than those of coal per unit of generated energy. In terms of electricity generation, smokestack emissions from combusting wood can be more than three times higher than those of natural gas, and 1.5 times those of coal per MWh. There is a carbon sequestration opportunity cost. Harvesting trees for energy releases carbon that would otherwise have remained stored in the forest. It also forgoes future carbon sequestration that otherwise would have occurred had the trees been allowed to continue growing. The re-sequestration of the released carbon back into biomass is not instantaneous. It takes a long time for the CO2 emissions from burning trees to be re-absorbed in new additional biomass. Because of the combination of these factors, it takes a long time before the CO2 absorbed by additional tree regrowth offsets the increase in CO2 emissions associated with burning wood for energy (relative to the emissions generated by burning fossil fuels to yield an equivalent amount of energy). As a result, the increase in atmospheric CO2 emissions from burning trees for energy persists for many years. This delay before atmospheric CO2 benefits are achieved is referred to as carbon payback time—”when preharvest carbon levels are reached (absolute carbon balance)”—or as time to carbon parity—”when comparing carbon levels to a reference case [such as when fossil fuels are burned and the trees remain growing] (relative C balance).” The payback time varies according to where trees are grown, type of energy generation facility, and type of fossil fuel being replaced, among other factors. In the case of mature forests, there may never be a complete payback, if the replanted forest is regularly harvested. How long are carbon payback periods? Several studies indicate that the carbon payback periods can be on the order of decades to more than a century, varying by forest type and the fossil fuel being compared against. Payback periods in this range are summarized by the European Joint Research Centre (2014), which draws from a half-dozen studies covering temperate and boreal forests from Europe, Canada, and the United States. Another example is Laganière et al. (2017), which analyzed carbon payback periods for various bioenergy feedstocks sourced from Canadian forests relative to coal-, oil-, and natural gas-fired power and heat generation. Figure 1 summarizes their results, with each black bar indicating the number of years that bioenergy results in increased CO2 levels in the atmosphere relative to the fossil fuel alternative. Source: Laganière et al. 2017. “Range and Uncertainties in Estimating Delays in Greenhouse Gas Mitigation Potential of Forest Bioenergy Sourced from Canadian Forests.” Global Change Biology Bioenergy 9 (2): 358–69. Among other studies coming to similar conclusions, Mitchell et al. (2012) analyzed an even broader set of forests and harvesting regimes and found most options to have payback times of more than 100 years, with the fastest payback times for a limited number of forest types and management regimes being at least 30 years. The science office of the Department of Energy & Climate Change in the United Kingdom had similar findings. Why does the time delay to carbon payback matter? Burning biomass for energy releases a big “pulse” of CO2 into the atmosphere relative to what would otherwise have been emitted if the power generator had continued to use fossil fuels. But the world needs to dramatically reduce greenhouse gas emissions over the coming three decades and peak global emissions as soon as possible, if it is to stay below a 2°C temperature rise relative to pre-industrial levels, let alone below a 1.5°C rise. There is a significant environmental cost to delaying greenhouse gas emission reductions, as recognized by the fifth assessment report of the Intergovernmental Panel on Climate Change. Now is not the time to increase atmospheric CO2 concentrations over decadal or century timescales. But won’t trees that are already growing elsewhere re-absorb the CO2 released from harvesting and burning trees, “offsetting” the emissions? No. Those trees growing elsewhere would have grown anyway in the counterfactual situation where fossil energy was burned instead of wood. Thus, their absorption of CO2 is not “additional” and cannot be counted as an offset for absorbing the CO2 released by burning trees for energy. But haven’t trees used for bioenergy already absorbed CO2, so their emissions are not “new”? Some people argue that it is okay to cut down and burn trees because the trees have already absorbed carbon from the atmosphere during their growing phase. In other words, they argue that burning trees for energy should be credited for the carbon that the same trees absorbed when they grew. However, as far as the atmosphere is concerned, the carbon stored by trees is in the trees, and not in the atmosphere. Cutting down and burning the trees converts this carbon into CO2, increasing the concentration of CO2 in the atmosphere. Meeting global temperature goals requires keeping the carbon sequestered in trees for as long as possible. Are there any tree-based feedstocks that could be beneficial from an atmospheric CO2 perspective? Some sources of bioenergy have shorter carbon payback periods. These include various forms of tree-based residues and wastes, including forest slash left over after harvest, black liquor from paper making, unused sawdust, and urban wood waste. Have others arrived at similar conclusions? Bernier, P., and D. Pare. 2012. “Using Ecosystem CO2 Measurements to Estimate the Timing and Magnitude of Greenhouse Gas Mitigation Potential of Forest Bioenergy.” Global Change Biology Bioenergy 5 (1): 67–72. Brack, D. 2017. “The Impacts of the Demand for Woody Biomass for Power and Heat on Climate and Forests.” London: Chatham House: The Royal Institute of International Affairs. Holtsmark, B. 2012. 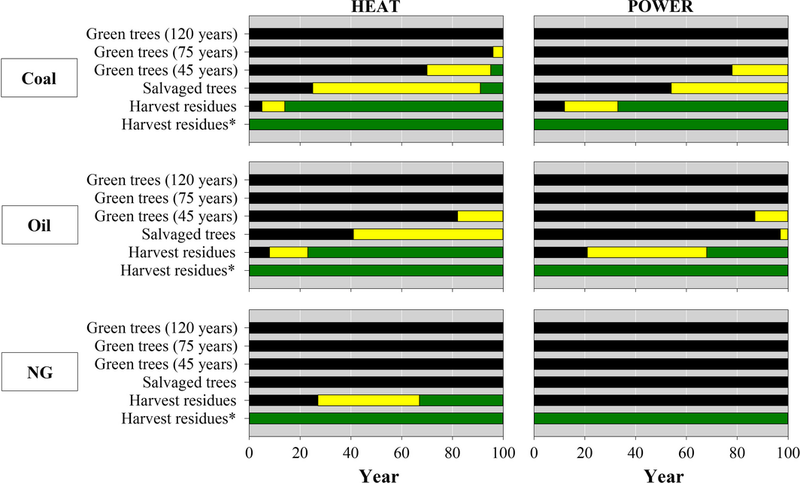 “Harvesting in Boreal Forests and the Biofuel Carbon Debt.” Climatic Change 112 (2): 415–28. Hudiburg, T. et al. 2011. “Regional Carbon Dioxide Implications of Forest Bioenergy Production.” Nature Climate Change 1: 419–-23. McKechnie, J. et al. 2011. “Forest Bioenergy or Forest Carbon? Assessing Trade-offs in Greenhouse Gas Mitigation with Wood-based Fuels.” Environmental Science & Technology 45: 789–95. Mitchell, S.R. et al. 2012. “Forest Debt and Carbon Sequestration Parity in Forest Bioenergy Production.” Global Change Biology Bioenergy 4 (6): 818–27. Stephenson, A., and D. MacKay. 2014. “Life Cycle Impacts of Biomass Electricity in 2020.” London: UK Department of Energy & Climate Change. Walker, T. et al. 2010. “Biomass Sustainability and Carbon Policy Study.” Brunswick, ME: Manomet Center for Conservation Sciences. Zanchi, G.A. et al. 2012. “Is Woody Bioenergy Carbon Neutral? A Comparative Assessment of Emissions from Consumption of Woody Bioenergy and Fossil Fuel.” Global Change Biology Bioenergy 4 (6): 761–72. What should the EU do with the revised Renewable Energy Directive? First, the EU should pass an amendment to the Renewable Energy Directive to limit the definition of renewable biomass from forests to residues and wastes. The current sustainability criteria for bioenergy proposed by the European Commission do not ensure that use of bioenergy results in CO2 reduction benefits over fossil fuel alternatives in climate-relevant timescales. Second, the EU should phase out subsidies and incentives for the use of stemwood and stumps. Tree-based wastes and residues should benefit from subsidies or incentives only if they have no major alternative uses. In practice, the quantity of biomass that results in CO2 benefits for the atmosphere is likely to be limited relative to the total demand for renewable energy. The enhanced EU renewable energy target should instead be met by increased investments in wind, solar, and other zero-emitting energy sources with unambiguous climate benefits. And efforts to increase energy efficiency should be strengthened. If the EU does not restrict biomass to genuinely CO2-friendly feedstocks, other countries will likely adopt similarly lax regulations that allow trees to be used as renewable energy sources—with significant negative consequences for forests and climate.